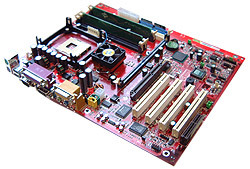 While most Pentium 4 motherboards for sale right now use DDR RAM, if you want the most performance your only real alternative is an RDRAM based board. Why is that you ask? 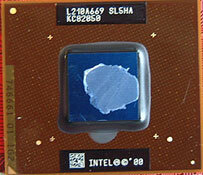 Simple, RDRAM is the only type of memory that can currently satisfy a Pentium 4's memory bandwidth needs. 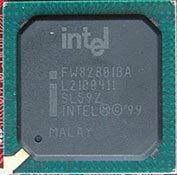 The MSI 850 Pro5 uses the i850 chipset and has support for Socket478 Pentium 4's running on a 100 MHz FSB. There are four RIMM slots which supports up to 2 G worth of PC800 RDRAM with MSI's trademark fourth RIMM perpendicular to the rest. 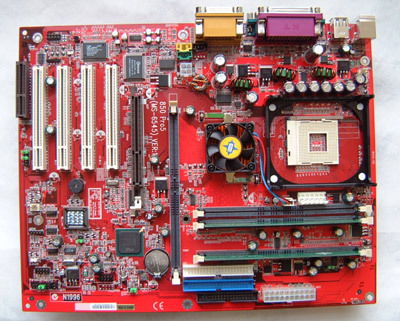 The MSI 850Pro5 is built on 4-layer PCB technology and it's among the least expensive Pentium 4 motherboards with a retail price of just $175 CDN ($115 US). Goodies that the motherboard comes with include a 4X AGP port (with the 1.5V lock), four PCI slots, one CNR and onboard 5.1 audio which uses the C-Media 8738 chipset. As we can see the layout of the 850 Pro 5 is quite different then what we've become accustomed to. The main that stands out is the odd placement of the fourth RIMM slot. According to MSI, placing the fourth RIMM perpendicular to the other RIMM's improves stability and gives cleaner/shorter traces to the i850 chipset which also improve performance. It was nice to see active cooling on the i850 chipset which can generate a bit of heat if left on its own with passive cooling. 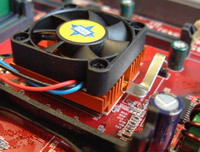 With computers it is always better to error on the side of caution and go with the most amount of cooling rather than the least.